Today I am grateful to go to Kingston Mines blues club last night with Tim. Today I am grateful for 2 days in Champaign, IL. Today I am grateful for a drink with Rachel last night in Champaign. Today I am grateful for some kind words from my manager yesterday. Today I am grateful for Taco Tuesday at Flaco's. Today I am grateful to arrive home safely yesterday. Today I am grateful for a return to Spartan Stadium to watch the game with friends from college. Today I am grateful I got out of a hackathon on a Friday night before 1AM. -dinner at the spy-themed Safe House last night. Today I am grateful for sushi last night with Rachel and Jim. -a chance to learn the basics of CNTK at yesterday's hackathon. Today I am grateful for a company reception last night at Optimism Brewery in Seattle. Today I am grateful for dinner and a movie with Glenn yesterday. Today I am grateful to ask about software on social media and get help from the creator of that software. Today I am grateful for free online learning resources. Today I am grateful for my new (to me) Surface Book. Today I am grateful to walk 5 miles yesterday. Today I am grateful for healthy teeth. Today I am grateful that I can walk to work. Today I am grateful for the NFL Pass to watch all the games. Today I am grateful to spend time with Chris this weekend. Today I am grateful for dinner last night with Tim to celebrate his birthday. Today I am grateful to successfully deliver a new AI presentation last night for the first time. Today I am grateful I've made it to the gym almost every day for the past month. Today I am grateful to teach at the University of Illinois yesterday. Today I am grateful for a clean apartment. Today I am grateful for a walk around LaGrange, IL yesterday afternoon. The Warrior's Apprentice is the fourth book I've read in Lois McMaster Bujold's Vorkosigan Saga; but it is the first one to feature Miles Vorkosigan, the protagonist of most of the series. An assassination attempt on Miles's mother during her pregnancy resulted in Miles being born with extremely brittle bones. Despite this handicap, he attempts to pass the rigorous requirements of the military academy on his home planet of Barrayar. After breaking both his legs in a physical exercise, Miles travels to his mother's home planet to visit his maternal grandmother; but is sidetracked by the adventures he encounters when he buys one spaceship and captures another. It all leads to political intrigue and an attempt to frame Miles for treason. I really like the character of Miles - an unlikely hero, given his handicap and his sub-5-foot stature. He is especially disadvantaged because Barrayar is a planet that disdains imperfections, often aborting "inferior" fetuses. He is a great contrast to his noble father and his headstrong mother. The Warrior's Apprentice advances the story of the "Vorkosiverse", introduces a significant new character, and stands alone as a good adventure story. I have known Jim Holmes for years, and I have experienced many times his presentations and his writings about leadership skills. 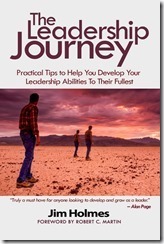 This year, he finally compiled that advice into a book - The Leadership Journey. He draws on his experience in the US Air Force and in the business world, providing examples of himself and others in a leadership role. It's no accident that Integrity tops this list. "Integrity is a coin you can’t afford to spend," he correctly asserts, pointing out the long-term damage when trust erodes. Each chapter focuses on one key point of leadership and includes one or more exercise. Typically, each exercise asks the reader to write down some ideas; step away for a few minutes; then return and review what he wrote. They are deliberately time-boxed to keep the reader focused and to give her time to reflect on the ideas. For example, one exercise asks the reader to identify a few effective leaders from their own experience and identify traits they have in common. The book advises a few things that I've been doing for years, such as writing down what needs to get done and keeping track of wins. But it also includes new (to me) ideas, such as recognizing small victories to foster success. At 107 pages, this is a quick read (I finished on a flight from Seattle to Chicago); but it is dense with good advice. Much of the advice may seem like common sense to you. But I've made many of the mistakes pointed out in this book and I've worked with many managers who have made these mistakes. Reinforcing these ideas is a step toward internalizing them. I was recently introduced to the Developer on Fire podcast, hosted by Dave Rael. Dave has had an impressive list of guests on his show the past few years, which is one reason I was excited about being interviewed by him. We spoke less about technology than about my experiences in my career and my philosophy toward work, education, and the community. Thursday Next is an agent working for the British Special Operations law enforcement agency in an alternate world where England and Russia are still fighting the Crimean War, where Wales is an independent country, and where time travel is possible. The people of this 1985 England love their literature. They are so passionate that literary arguments sometimes erupt into riots and a special government police department exists solely to deal with crimes of literature. Thursday works for this department. In The Eyre Affair by Jasper Fforde, Thursday's uncle Mycroft invents a machine that allows people and characters to travel in and out of fictional books. If one enters a book and changes the plot, the story in the actual book changes. If this happens in an original manuscript, every copy of that book is modified. The Villainous Hades kidnaps Mycroft, steals the machine and some original literary classic manuscripts; then blackmails England, threatening to kill characters in the book, destroying England's most beloved literature. And only Thursday can stop him. If you think this sounds like some serious suspension of disbelief, you'd be right. If you think it sounds somewhat silly, you are right about that as well. This novel is filled with weird science and over-the-top characters with names like Braxton Hicks and Jack Schitt. But it works. And not just as satire and humor. Although the story never takes itself too seriously, it never falls into the completely absurd, as with authors like Douglas Adams and Terry Pratchett. 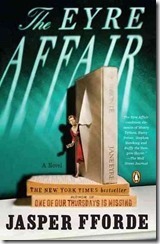 The Eyre Affair is a silly, adventure, detective, sci-fi, comedy story filled with action and memorable characters.